An anti-decubitus toilet seat can help to prevent painful pressure areas / wound sites (decubitus or haemorrhoids)! Frequently for those with disabilities, it may be found that the time for going to the toilet amounts to more than an hour. It is all the more important that the toilet seat prevents an impending decubitus or counteracts an existing decubitus and contributes towards pain relief. Our toilet seats, which are supplied as standing aids or as anti-decubitus seats, consist of an easy to clean solid material and can be folded up. Result: no hollows or edges, where grime can build up. These are available individually for WCs, as well as in combination with the VAmat. Wheelchair users, as a rule, change seats by moving sideways i.e. by supporting and relocating (“throwing their bodies”). 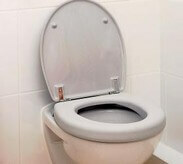 Extreme lateral forces come about, which can cause the WC seat to slip, break, or otherwise become damaged if the WC seat is not adequately affixed to the toilet bowl. On no account are toilet seats suitable, where suction cups, clamps or retaining straps have been used to attach these (Risk of accident!). Standard toilet seats and anti-decubitus toilet seats by SPAHN REHA have a special stainless steel fastening element with a surrounding steel inlay and can be optimally fastened to the toilet bowl in various positions using stainless steel screws. In order to convey a feeling of safety to the toilet user when sitting, the body should not be permitted to tilt while seated, i.e. the body requires lateral support. This necessitates a separate non-positive stabilisation of the seat using special stabilisers integrated into the seat in non-positive conjunction with the fastening element, as well as a firm mounting (as described above). Padded or merely foam-covered seats do not fulfil this criterion. The same applies to seats whose base is made from wood or plastic. 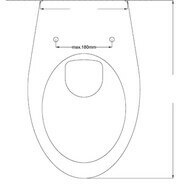 SPAHN REHA toilet seats fulfil the criteria. Fundamentally, the surface of a toilet seat must not be too smooth. Nor should it be too deeply textured. If the surface is too smooth, the user will stick to it; the decubitus prophylaxis is no longer effective. If the surface is too deeply textured (rough), sitting will feel uncomfortable, if the user has feeling. The texture should prevent sticking. The rule is: as little texture as possible, as much texture as necessary! SPAHN REHA has optimised the texture, based on 18 years of experience. Creases are prevented from occurring. Smallest surface possible for the seat, because smaller areas gather less grime. Material closed porous, to avoid the absorption of moisture. Easy accessibility to all parts of the seat, can be folded up for optimum cleaning, removable without tools. Material suitable for disinfection. Before flushing, the lid should always be closed (bacterial contamination). Because of the different anatomies of individual users, absolute decubitus prophylaxis is only possible in the rarest of cases. However, experience shows that individuals find their ideal sitting position very quickly. Essentially, the larger the seat area, the smaller the contact pressure. The body burden can be influenced by contouring and the use of pressure absorbing material. Foams, as a rule, do not absorb pressure, since, under a load, the material deforms to one side and the user is sitting hard on the core (the base plate). SPAHN REHA also has long-term experience in respect of pressure distribution.